Rip the slices of bread into 1cm (1/2in) pieces. Heat three tablespoons of the oil in a small non-stick frying pan, add the bread pieces and sprinkle over the lemon rind. Cook over a medium heat for 3 minutes or until they are crisp and have a nutty golden colour. Tip on to kitchen paper and season to taste. Set aside. To make the dressing: place the balsamic vinegar in a screw-topped jar with the lemon juice and remaining five tablespoons of olive oil. Season to taste and shake well to combine. 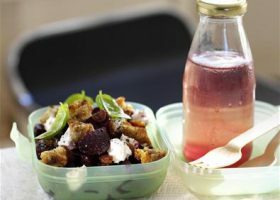 To assemble the salad: place beetroot cubes on a large plate or platter and crumble over the goats’ cheese, then sprinkle the sultanas on top with the croutons and basil leaves. Drizzle over the dressing and serve immediately.